Though the days are getting longer, there's still a chill in the air. Desperate to discard your wintry clothing in favour of the light, fresh styles of spring? Try this look inspired by a cozy weekend morning at home. Layer this luxurious, ALC sweater over a silk staple, and add a playful print (the blue & white mix is both classic and statement-making) with these new-in Joes jeans. Whether you leave the house or stay in, loafers complete this weekend-chic look. Fresh style deserves to be paired with fresh beauty, so we suggest trying a pale peach colour washed across your eyelids and cheeks, and hair swept back into this posh pony. Paint those digits in matte grey for a trendy touch, and you're all set. We adore the calm mix of blues, charcoal, and white in this pretty bedroom. 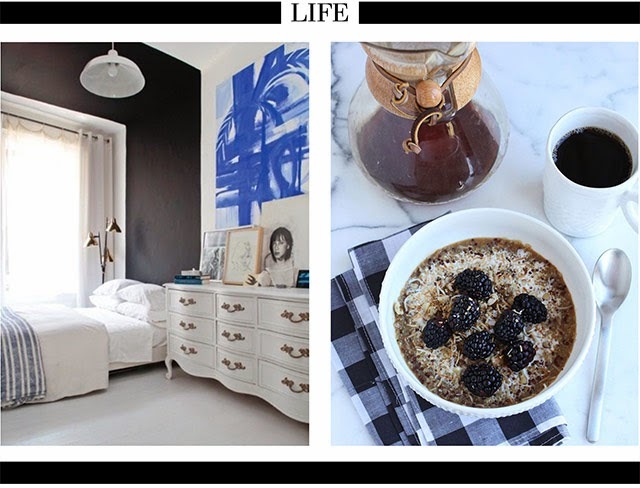 Imagine relaxing here on Sunday morning with the latest glossy, this coconut breakfast quinoa, and (of course) a coffee.